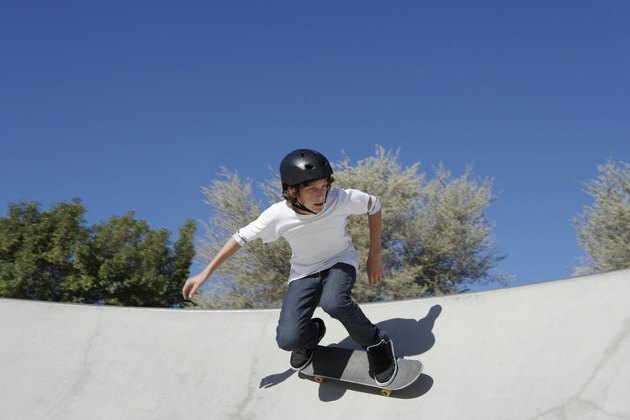 Skateboarding requires a high level of balance and coordination, which works muscles throughout your body. You can get a good workout by just skateboarding in one direction. Performing skateboarding tricks increases the demands on your muscles because they require multiple joint movements in rapid succession. Skateboarding tends to favor muscles on one side of your body, and you may want to balance this form of exercise with weight-training or developing ambidexterity in your feet. Skateboarding works your core muscles. Your core muscles stabilize your body and allow you to balance on unstable surfaces, which is a critical component of skateboarding. The core includes your abdominal muscles, the muscular structure of your hips, and muscles that surround your spine. Your hip muscles include over 10 inner muscles that stabilize the hip joint. Spinal muscles include large muscles such as the latissimus dorsi and trapzius in addition to several inner muscles that extend the length of your spine. Your quadriceps are worked heavily with skateboarding. The quadriceps include a group of four muscles that form the front of your thighs. These muscles extend your knee, and flex your hip joint. Skating moves such as the ollie involve knee extension and hip flexion. Skaters accelerate upward by explosively straightening the legs, which extends the knees. The hips flex shortly after impact on the downward phase of the ollie. Skateboarding works your hamstrings, which include a group of four muscles that extend from your glutes to the back of your knee. The hamstrings flex your knee, which allows you to bring your calves up toward the back of your thigh. Flexing your knee is important for crouching down to maintain a lower center of gravity while skating. Hip extensions move the top of your pelvis backward, which is an important movement for gaining forward speed with one foot while skateboarding. You can develop the muscles in your lower legs by skateboarding. The gastrocnemius muscles, known as the calves, assist your quadriceps extend your knees. Skateboarders rely on the gastrocnemius for plantar flextion of the ankle, which points your toes downward. Planter flexing allows you to shift your weight toward the front of your body, which helps turn the direction of a moving skateboard in that direction. The tibialis anterior muscle, which forms your shins, controls dorsal flexion. Dorsal flexion allows you to tilt your heels downward while skateboarding, which provides directional control in the opposite direction of plantar flexion. Why Does Jumping Rope Help You Jump Higher?